The Rebel Sweetheart. : Mother's Day Gift Event | Win a Cetaphil Prize Pack! Mother's Day Gift Event | Win a Cetaphil Prize Pack! Everyone loves their mom and always wants to find the best gift to make her feel loved and appreciated. These are the gifts I have found and would love to share with you. After you enter my giveaway head over to Makobi Scribe to see her Mother's Day gift ideas worth over $3000. Then join her giveaway, with a grand prize of Karina Dresses worth over $1000. For this particular event (and in celebration of Cetaphil's 65th anniversary), I'm giving away not one but TWO Cetaphil Prize Packs! That means there'll be two winners for this giveaway and each of them will be receiving the following products: 1 Cetaphil Gentle Cleansing Antibacterial Bar, 1 Cetaphil Daily Advance Ultra Hydrating Lotion, and 1 Cetaphil Daily Facial Moisturizer. To enter the giveaway, simply complete the tasks indicated on the Rafflecopter below. The more tasks you complete, the more entries you earn. More entries mean better chances of winning! This giveaway will run from May 1st until May 18th, and is open worldwide. 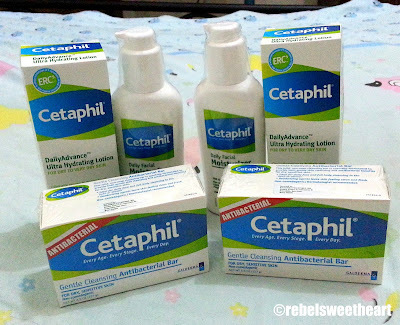 Big, big thanks to our sponsor, Cetaphil Philippines, for providing the prizes! Disclosure: Makobi Scribe Reviews, LLC or the Mother’s Day Gift Event Bloggers are not responsible for sponsors that do not fulfill their prizes. i love using cetaphil gentle cleanser. I would like to try Celeteque's Ultra Hydrating Lotion. I have tried the gentle cleanser because it is very mild on skin while leaving skin cleansed and moisturized. I'm a Cethaphil user ever since. Been loyal to that. So gentle. loved to try Celeteque's Ultra Hydrating Lotion. I haven't tried Cetaphil products, but I'd love to try the Daily Advance Ultra Hydrating Lotion. been using the antibacterial soap because i have sensitive skin. My favorite Cetaphil products are Cetaphil Gentle cleanser,Daily Advance UH Lotion & Cetaphil Moisturizing Cream. Haven't tried them yet, but I'd love to try the Cetaphil Daily Advance Ultra Hydrating Lotion. Wow so many Mother's Day contest out there ! I'd love to try the Cetaphil Daily Advance Ultra Hydrating Lotion. What's your favorite Cetaphil product? I like their moisturizer..it's very light and mild. Cetaphil gift pack may be a nice gift for mothers day as it's really a great product. Very nice giveaway.thanks for this and goodluck to the winner. id like to try the Celeteque's Ultra Hydrating Lotion. I love their gentle cleanser & Lotion.. very light & super mild.. I like to try the Cetaphil Gentle Cleansing Antibacterial Bar. Been using Cetaphil Gentle cleanser for my oily skin for years now. i love cetaphils gentle cleanser since high school but havent tried the ultra hydrating lotion yet. I want to try Cetaphil Gentle Cleansing Antibacterial Bar.. maybe that's the answer that I've been long waiting for.. to lessen my skin problems.. I would love to try Cetaphil Ultra Hydrating lotion as I have been hearing from reviews that it really moisture and makes skin soft. I tried the cetaphil gentle cleanser for my baby. She used to have sensitive skin so the best cleanser for her is cetaphil. tnx. I haven't tried Cetaphil products yet, but I'd love to try the Daily Advance Ultra Hydrating Lotion. i super love the cetaphil hydrating lotion . its very smooth on my skin .